• All necklaces come packaged securely and will be mailed in a bubble envelope.All other Alice In Wonderland jewellery can be viewed here: http://www.etsy.com/shop/LaurasJewellery/search?search_query=alice+in+wonderland&search_submit=&search_type=user_shop_ttt_id_5320227&shopname=LaurasJewellery〈id_override=-1John Tenniel was the artist who illustrated Lewis Carroll’s Alice’s Adventures in Wonderland and Through the Looking-Glass. These images are now copyright free and therefore can be used by artisans. As such, I have used Tenniel’sillustration to make these striking pieces of jewellery. i recieve my mad hatter necklace and this was by far the best online shopping experience!!!! it's Looks amazing, really fast delivery, and packaged lovely i'm very very pleased thank you. Very very nice seller, i contact her and got almost immediat answer, of course i made another purchase!! 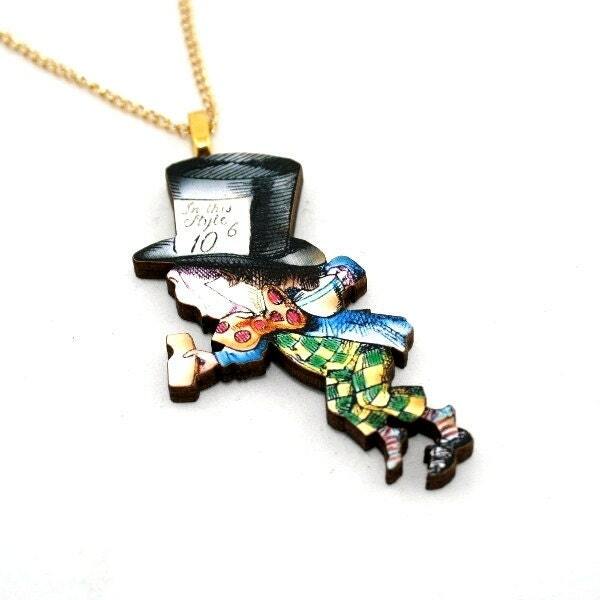 I absolutely love this Mad Hatter necklace. It arrived quite quickly, is very detailed with bright colours and is well made and sturdy. I would have liked a longer chain, but I can always transfer the pendant.